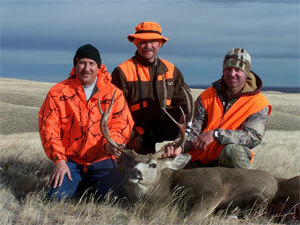 Our trip started with three of us, Chris, my hunting partner, Mike, my brother and I applying for deer tags for the 2006 Montana general deer season. It was a long wait, but, finally, when we checked the computer it said successful. We all drew a general deer tag (buck or doe) and a white tail doe tag. We were going to Montana. We left California on November 1 and were in Montana after a 26-hour drive. That was a very long drive, but well worth it. We met a friend of Chris Stan that evening and made plans for the next day. 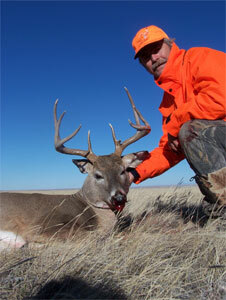 Chris and I were going to hunt together and Mike would go with Stan, as he also had an antelope tag. That first morning, we parked my truck at the beginning of a large cooley, what I call a draw or ravine in California, and made a long drive across the Block Management Area we were hunting, seeing moose, coyotes, white tail and mule deer. The moose were great to see. They were at the start of our drive. First we spotted one, and then there were two. What a thrill to see two moose in the wild like that. After the long walk, we were picked up by Stan and Mike and dropped off for another long hike. As Chris and I were working our way up this new cooley , Chris stops and said that there was a big mule deer buck lying right there in front of us. We slowing keep moving around the corner of this cooley, when, all of a sudden, fifty yards in front of us was one of the largest mule deer bucks I have ever seen. Being closer to the deer, I took the first shot at the big buck, missing it by a mile and then Chris shot. We watched as the big buck walk over the ridge out of the cooley and out of gun range. Buck fever must have kicked in! I was so close that my rifle barrel could have touched it! I think that level of excitement keeps me hunting year after year. After another long hike through a cooley, seeing 2 more big bucks, we called it a day and went bird hunting. Even that was exciting as we picked up six grouse. A little later we did an evening hunt and called it quits for the first night. The next morning, we decided to make one large dive with the whole group to start the day off. We had two more friends from California with us, Todd and Rob. The plan was to make a large drive that covered most of the management block area we were hunting. Mike and Stan started from the back of the block management area and the rest of use worked our way toward them from the front. We positioned one person at the end of the cooley that Stan and Mike were coming up, and another person was left off at the end of the cooley that Chris and I were going to work up. Chris and I made our way through the same cooley that we missed that big buck in the day before. This time, it was empty. When we finally got through with that hunt, Stan and Mike pick us up, but this time my brother had gotten a very nice 4 * 4 mulie and his antelope was in the back of the truck as well. Chris said to Mike, at least someone can hit one of these big bucks. After that, we worked a few more drives and had a couple more big bucks make their escape without a shot fired. After the last drive, we made our way to the top of this large plateau. Earlier in the day, Mike and Stan had talked to a couple of hunters that came 200 miles just to hunt the plateau. This made me want to take a little time and look it over. I really wanted a white tail buck and they had mentioned seeing one there. Chris and I walked around the top for a bit and did not see anything. We were working our way back to the truck when I asked Chris if it was ok to make a little walk down the side of the plateau and meet him back at the truck. Oh, did I mention that the wind was blowing about 40 mph? Chris kept working his way back to the truck and I made my way down the side of the hill and started scanning over the edge of this little cooley. It looked like the perfect place for a big old buck to hide from the cold wind that was blowing. It had to be less then 10 minutes when I walked over the edge and looked down this cooley when I spotted a cow trial at the very bottom. To my surprise, I could see this beautiful white tail rack just glowing in the sun, moving back and forth without any idea I was standing right behind him. I could not believe my eyes. I could only see the top of the rack; there was some hay between us that keep his body from view. Being only fifty yards from the buck, I placed the scope on his horns and lowered the cross hairs to the back of his head and shot. He did not move an inch. His head just dropped right in his bed. I moved down the little cooley and could not believe my eyes. 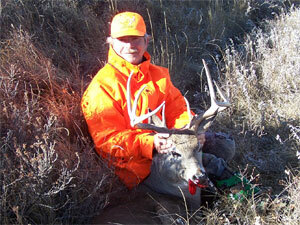 There laid the most beautiful 9-point white tail buck. I just sat there for a few minutes and said a little prayer of thanksgiving to God. I walked up the other side of the cooley to see if I could make eye contract with Chris. At this point, with the wind blowing so hard, he had not heard the shot and was standing by my truck. I must have looked like a crazy man in orange jumping up and down waving at him. It must have worked though since he started driving the truck up the plateau. I was waiting for him to stop, but he was confused as to what I wanted him to do. I finally had to run up the hill and get him to back up to where we could take the truck down and retrieve my buck. We pulled the deer out of the cooley, gave each other high fives, took many pictures, and took off to show the rest of the party our trophy. When we finally met up with the rest of the gang, Stan had a really nice 3 * 3 in the back of the truck. This was more like the trip we all hoped for during our 26-hour ride to reach Montana. What a second day. On the third day, we still had three more bucks to take. There were six of us that morning in two rigs. We stopped at the first cooley where Chris and I walked the first day and encountered the two moose. We left one rig there and Mike and I made a morning drive and work our way to the pickup point. Only a couple of small bucks and a few does were seen. We then dropped the others off at another cooley and we made our way to the new pickup point, but, this time, we got the call that another big mulie buck was down. 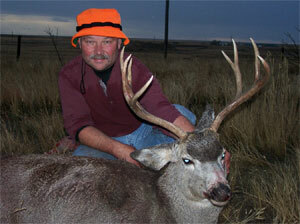 We worked are way over to pick them up and found them with a 26 inch wide 4*4 mulie with eye guards. What a beautiful buck. Todd had bagged this bug with Rob and Chris assistance. As it was getting late, Mike, Josh and I wanted to hunt some grouse. We bid farewell to Chris, Todd and Rob and went after some birds. Chris, Rob and Todd keep hunting, looking for those last two bucks. They decided to make a drive in a new area, which we had not hunted yet. As they were working there way through the cooley, Rob took the first and only buck he had seen during the trip, a really nice 2*2 mule deer buck. That left them with just one more buck tag to fill. They load the buck up and were heading out of the Block Management Area, with the rain starting to come down heavy. On their way out, Chris spotted a group of deer in a creek bed, just before they got to the last gate. He got out and worked his way up a little creek bed and was able to bag a beautiful 22 inch wide 4*4 hanging out with his harem of does. With that, we were tagged out! Over the next two days, we were able to fill our white tail doe tags and take a few more birds. What a great hunt. This will definitely be a hard trip to top, but we are going to apply again next year and maybe do better. I would like to thanks to Stan, Clarence and Jeromy for their great Montana hospitality and looking forward to hunting with them again.